June 2012 - FEMtools 3.6 Released! October 2009 - FEMtools 3.4 Released! January 2009 - Dynamic Design Solutions Celebrates 15th Year! Exactly twenty years ago, Mueller-BBM signed up to become the FEMtools distributor for the German, Austrian and Swiss region. It was the start of a successful partnership with DDS to promote FE model updating and to provide training to the many users of finite element technology in the mechanical, automotive and aerospace industries in the region. Mueller-BBM is one of the leading engineering firms in Germany for consulting services, expert reports, measurements and planning in all areas of acoustics, physics, and environmental protection. Dynamic Design Solutions announces the release of FEMtools 3.8.2. Support for Windows 10 Operating System. Updates of the Abaqus, Ansys, Nastran and Universal File data interfaces. Mesh generation extended to quadratic elements and generation speeds of up to 10 times faster. An improved formulation for quadratic shell elements. A new pretest analysis utility to identify the visible nodes considering a particular viewing direction. These nodes can be used as candidates for an optical full field measurement. A new example on Discrete Material Optimization (DMO) that illustrates how to optimize ply orientation using the Genetic Algorithm optimizer. New settings have been added to the Modal Parameter Extractor applet in response to customer requests. FEMtools 3.8.2 is available as a free upgrade for all customers with current maintenance and technical support contract. Customers with current support and maintenance can find more information on this release and how to download the installation packs in the FEMtools Support site. A login name and password is required to access the support pages. If you have a current Maintenance and Support contract and did not yet receive a login name and password, then register here or send a request to support@femtools.com. The research team will present their most recent results at the International Conference on Engineering Vibration (ICoEV), September 7-10, 2015, Ljubljana (Slovenia). Dynamic Design Solutions announces the release of FEMtools 3.8.1. FEMtools 3.8.1 is available as a free upgrade for all customers with current maintenance and technical support contract. License files for FEMtools v3.8.0 remain valid for v3.8.1. Dynamic Design Solution will collaborate with m+p International, University of Illinois at Urbana-Champaign and The Modal Shop to present a one-day seminar on nonlinear modal analysis. This one day seminar serves as an introduction to the field including lab demonstrations of the tools in operation on a simulated but representative model of an airframe with nonlinearities. Presenter is Prof. A.F. Vakakis; Date and location: June 15, 2015 on the campus of the University of Illinois at Urbana-Champaign. Contact to reserve your place is Tim Copeland at m+p International (217-391-4573). FEMtools was used for pretest analysis, FE-test modal correlation and FE model updating of the airframe model (see images). Dynamic Design Solutions has joined a Belgian group of companies that will advise on research of the mechanical properties of components that are manufactured using 3D printing techniques (aka additive manufacturing). The group aims at developing validated design tools for reliable functional industrial components. Several 3D printing techniques will be evaluated and manufactured products studied under different realistic load cases to obtain information on stiffness and strength properties, variability of the results and property influencing factors. The research is performed under a Belgian technology transfers program (TETRA) and aims to obtain guidelines and best practices information of immediate interest to industry. Several campuses of KU Leuven (campus Thomas More, KAHO, PMA) collaborate to complete the two-year project with a group of companies advising on the work program. Apart from DDS, other advising companies include Siemens, Materialise and several orthopedic products manufacturers. Dynamic Design Solutions announces the release of FEMtools 3.8. The new version is available for download from December 4. FEMtools 3.8 is available for Windows, Linux and Mac OS as a free upgrade for all customers with current Maintenance and Technical Support. 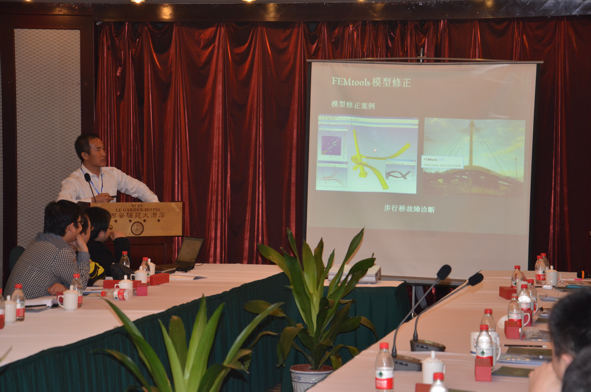 FEMtools Model Updating was introduced during a meeting of a Chinese interest group on Verification and Validation (V&V) that was held on 15 and 16 November 2014, in XiAn City, China. This meeting was organized by the Chinese Academy of Engineering Physics and Northwestern Polytechnical University. Participants from universities, institutes and companies attended presentations and discussion sessions about V&V topics related to structural dynamics, testing, computational mechanics, reliability and complex engineering design. Beijing ALLSTAR Technology Corporation, distributor of Dynamic Design Solutions in China, introduced FEMtools features for finite element model validation and updating and its applications in engineering (see picture). FEMtools was the only commercial V&V product presented at this meeting and its applicability in different fields of engineering was received with great interest by the participants. Dynamic Design Solutions has conducted compatibility tests with Mac OS X 10.10 Yosemite which have shown that the current FEMtools 3.7.2 version works without any specific issues under this recently released version of the Mac OS X operating system. Further compatibility and performance tests with the Yosemite version of Mac OS will be done and new information will be provided as it becomes available. Reprise Software, the developers of the Reprise LM license manager that is used by FEMtools, announces that IBM Platform Computing has added support for the Reprise License Manager (RLM) to its Platform RTM v9.1.3. IBM Platform RTM is an operational dashboard for IBM Platform LSF environments that provides comprehensive workload monitoring, reporting and management. Platform RTM provides a complete, integrated monitoring facility that is designed specifically for Platform LSF environments. FEMtools customers that use the IBM Platform License Scheduler will be able to benefit from integrated RLM support from the end of August, 2014. Dynamic Design Solutions announces the release of FEMtools 3.7.1. FEMtools 3.7.1 is a maintenance release that provides bug corrections and various enhancements to the framework, data interface programs, user interface, analysis modules, commands and API functions. The FEMtools eigenmodes solver now supports banded analysis for reduced memory requirements. FEMtools 3.7.1 is available as a free upgrade for all customers with current maintenance and technical support contract. License files for FEMtools 3.7.0 remain valid for v3.7.1. January 2014 - Celebrating 20 Years Specializing in Finite Element Model Updating! This year, Dynamic Design Solutions is celebrating its 20 years in business. Thanks to our customers, partners and friends we have been able to steadily grow our company and become the reference in the field of finite element model validation and updating for structural static and dynamic analysis. Today we are proud to count numerous prestigious and international companies that are market leaders in the automotive, aerospace and power industries among our customers. Our FEMtools software has also become an important tool for engineering students at academic institutions worldwide. Verification and Validation (V&V), complemented by Model Updating has become a standard tool for all CAE engineers. Dynamic Design Solutions is ready to serve your needs and offer expert assistance during the years to come. Researchers from the Center for Wind Energy at Middle East Technical University (METU WIND) in Ankara, Turkey have chosen FEMtools Model Updating to validate and update ANSYS finite element models of wind turbine components using results from modal testing. METU WIND is a university research center established in 2011 with the vocation of becoming a focal point at the national and international level by performing fundamental and applied research in the field of wind energy. Main areas of research include rotor blade aerodynamics, integrated design of wind turbine systems, wind farm design, energy storage, composites and material characterization. FEMtools will be used at the Structural Dynamics Laboratory, which is the main test and analysis facility of METU WIND for characterizing the vibration and structural dynamic behavior of aerospace, mechanical and civil engineering structures. INICAD is an engineering and software distribution and consulting company serving the Romanian market. Their activities span the fields of civil engineering, mechanical engineering and biomedical engineering. Invicom Test & Measurement provides test instruments, data acquisition systems, sensors and CAE solutions in Malaysia, Indonesia, Thailand & Singapore. They provide turnkey solutions to quantify, measure and process the measured data to obtain values that help to understand the real physics of the system, be it for finding fault, confirmation of simulation, improvement or as baseline parameters. Key customers are Automotive R&D departments, Civil & Structural Monitoring agencies, Aviation & Aerospace, HVAC manufacturers, Rolling Stock Manufacturers, Power Distribution/Production Facilities, Petroleum Process Plants (Offshore & Onshore), Consumer Products Manufacturers and Research Universities. Dynamic Design Solutions has completed the FEMtools 3.7 release with a version for Mac OS X. The installation package is available from September 17, 2013. FEMtools 3.7 for Mac OS X requires Mac OS X 10.7+ on Intel 64-bit architecture. Information on system requirements can be found here. The release includes all new features and changes that were previously introduced with the version for Windows and Linux OS. The FEMtools GUI is identical on all supported OS. At the same time, DDS released a new maintenance build of FEMtools 3.7 for Windows and Linux, and a patch installation package that upgrades the previously released version to the latest version. More information on these releases and how to download the installation packs is in the FEMtools Support site. A login name and password is required to access the support pages. If you have a current Maintenance and Support contract and did not yet receive a login name and password, then register here or send a request to licensing@femtools.com. Dynamic Design Solutions announces the release of FEMtools 3.7. The new version is available for download from September 2. FEMtools 3.7 is available on Windows and Linux as a free upgrade for all customers with current maintenance and technical support contract. Availability of the version for Mac OS X will follow at a later time and will be announced at this location. More information on this release and how to download the installation packs is in the FEMtools Support site. A login name and password is required to access the support pages. If you have a current Maintenance and Support contract and did not yet receive a login name and password, then register here or send a request to licensing@femtools.com. Time-locked license files (annual) for FEMtools 3.4-3.6 remain valid for v3.7. License files without expiration date issued for a previous version are not compatible with FEMtools 3.7 and will need to be replaced. Dynamic Design Solutions contributed to the IOMAC pre-conference courses by making a license of FEMtools available to the PhD students that participated. Each student had to complete a project that consisted of an operational modal test, finite element modelling, test-analysis correlation and FE model updating. 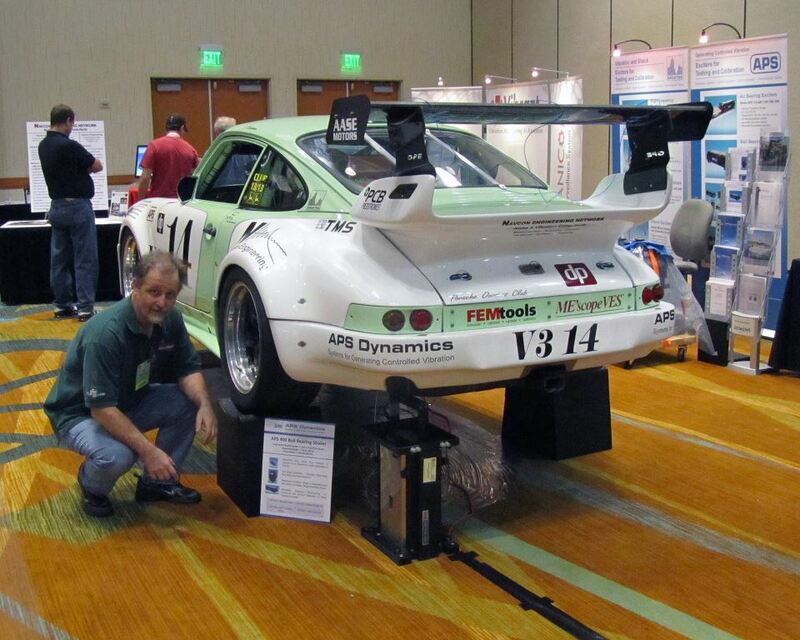 California-based FEMtools distributor NAVCON did some "shakin" of a Porsche 911 race car at the 31st annual International Modal Analysis Conference (IMAC) that was held last February in Anaheim, Los Angeles. The car was instrumented with PCB transducers and excited using a long stroke APS Dynamics shaker. Frequency response measurements were made in the exposition area using a Data Physics Mobilyzer. The data was used for modal parameter extraction and subsequent finite element model validation. The 911 with FEMtools logo set on custom built "raceramp" wheel stands. The shaker is visible behind the left rear wheel. Dynamic Design Solutions announces the release of FEMtools 3.6.1. FEMtools 3.6.1 is a maintenance release that provides fixes to issues reported after the previous release and provides various improvements and corrections to the interface programs, GUI, commands and API functions. Support for ANSYS 14.5 interface files has been added. This release has been verified for Windows 8. Dynamic Design Solutions has joined the MSC Software Technology Partner program as a Software Community Partner. By joining, DDS gains access to the marketing and sales resources of MSC Software and ensures access to the software licenses that are necessary for continuous interface development as well as training. The key benefit to MSC is that DDS provide leading-edge technologies which complement MSC's product portfolio. 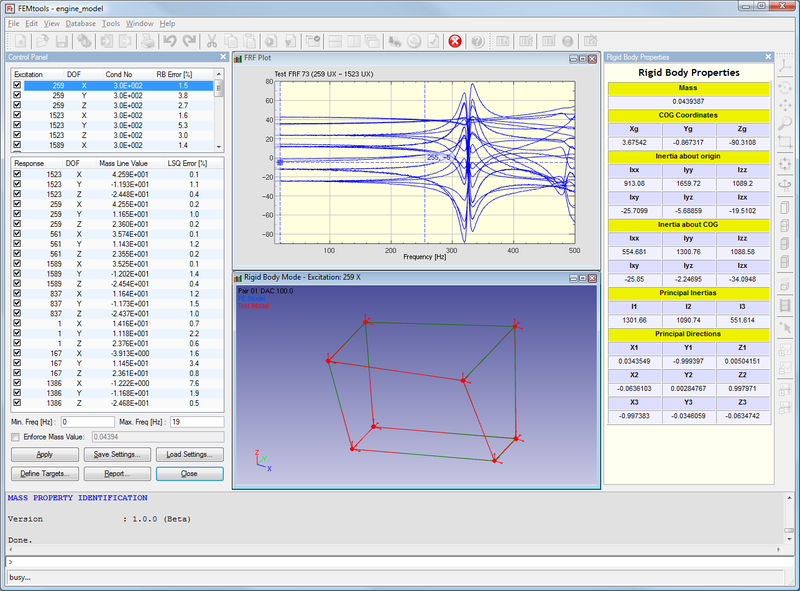 DDS develops and markets the FEMtools software that provides a critical link between experimental analysis and NVH simulation with MSC Nastran and Marc. For more information on MSC Software Technology Partners, click here. Dynamic Design Solutions announces the release of FEMtools 3.6. Frequency Response Functions (FRFs) can now be computed using the fast Pade Approximants method. FRF-Based Assembly (FBA), a new tool for dynamic substructuring. Time Domain Simulation, a new tool for response analysis in the time domain. It is now possible to supply a target value for the off-diagonal MAC values in the SEAMAC method. A new interactive applet for the FEMtools MPE (Modal Parameter Extractor) is added with FRF selection, frequency band selection, multiple band selection, complexity plot and more. For screenshots look here. Upgraded FE Data Interfaces and Drivers (Abaqus 6.12. Ansys 14, MSC.Nastran 2012, NX Nastran 8). For a complete list of changes, see the FEMtools 3.6 Release Notes which can be consulted in the FEMtools Customer Support portal. FEMtools 3.6 is available immediately on all platforms (Windows, Linux, Mac OS) as a free upgrade for all customers with current maintenance and technical support contract. The software can be downloaded from the Download Area of the FEMtools Customer Support portal. Access to the FEMtools Customer Support requires a user name and password. Time-locked license files (annual) for FEMtools 3.4.x and 3.5.x remain valid for v3.6. Perpetual licenses issued for a previous version are NOT compatible with FEMtools 3.6 and need to be replaced. Dynamic Design Solutions announces the release of FEMtools 3.5.3. FEMtools 3.5.3 is a maintenance release that provides fixes to issues reported after the previous release and provides various improvements and corrections to the interface programs, GUI, commands and API functions. Support for ANSYS 14 interface files has been added. The number of aircraft and aerospace companies that have joined the ranks of FEMtools users has steadily increased during the past years. They include major aircraft and engine manufacturers as well as component suppliers and research centers. FEMtools is used for FE postprocessing, dynamic simulation, model validation, model updating and structural optimization. Reference data comes from modal testing and ground vibration tests or classic strain gauge testing. Dutch Space is the largest aerospace company of the Netherlands. They are a well-recognized supplier to the international aerospace industry. Dutch Space started in 1968 and now employs a staff of about 210 researchers and engineers. Main activities are related to solar panels, launch systems, verification and simulation, descent and landing, and instruments. From July 2008 Dutch Space is a wholly-owned subsidiary of EADS Astrium. FEMtools is used for finite element model validation and updating of Ariane launcher frames using test data from strain gauges and accelerometers. Other global aeronautical companies that actively use FEMtools are Airbus, Avio, Boeing, EADS Cassidian, Goodrich Aerospace, Honeywell Aerospace, ITT Exelis, Jet Propulsion Laboratories, Korean Aerospace Research Institute, MTU, National Aerospace Laboratory (Netherlands), Northrop, and Rolls-Royce. Dynamic Design Solutions announces the release of FEMtools 3.5.2. Dynamic Design Solutions has developed a new bi-directional interface with the ARTeMIS operational modal analysis software. Using this interface FEMtools users can import ARTeMIS configuration files and associated time series data files and process those data in FEMtools DSP and FEMtools MPE. It becomes also possible to import and process time series using FEMtools scripts from other sources, for example from an SQL database, and then export the test data for processing and operational modal analysis using ARTeMIS. This way the SSI time domain extraction method that is available in ARTeMIS becomes more easily available to FEMtools users to complement the frequency domain method (pLSCF) that is included in FEMtools MPE. ARTeMIS is a specialized software for operational modal analysis developed and sold by Structural Vibration Solutions (SVS). For more technical papers, click here. Dynamic Design Solutions announces the release of FEMtools 3.5.1. This maintenance release provides important upgrades to the framework libraries and is released together with a new add-on for digital signal processing. Furthermore there are various minor improvements and corrections to the interface programs, commands and API functions. A new direct interface with Polytec data files is now included. License files for FEMtools v3.5.0 remain valid for v3.5.1. Support for Mac OS X 10.5+. Numerous extensions to interfaces and drivers with FE programs based on user requests. Support for new Ansys 13.0 binary file format. A new add-on for polyreference modal parameter extraction from FRFs or cross power spectra. A new interactive tool for pretest planning. Extended flexibility in choosing DOF and mode shape sets for correlation analysis. Topometry optimization using discrete parameters. For the complete list of changes, see the FEMtools 3.5 Release Notes which can be consulted in the FEMtools Customer Support portal. FEMtools 3.5 is now available as a free upgrade for all customers with current maintenance and technical support contract. The software can be downloaded via the FEMtools Customer Support portal. Access to the FEMtools Customer Support requires a user name and password. In response to growing demand from academic users, FEMtools 3.5 is now available as a 64-bit application for the Mac OS X platform. State-of-the-art software development technologies were used to keep the same user interface as on Windows and Linux. All FEMtools components, including solvers, data interfaces, graphics viewers and add-ons like the new modal parameter extractor were ported to the Mac. Screenshot of FEMtools on Mac OS X. The FEMtools 3.5 release, scheduled for fall 2010, will be the last version available for IBM AIX, HP UX, Sun Solaris and 32-bit Linux platforms. Future versions of FEMtools will continue to be supported on 32-bit Windows, 64-bit Windows and 64-bit Linux for x86. The MAC OS 64-bit platform will be added with the v3.5 release. This decision was taken to allow us to accelerate development and introduce new technologies. Depending on customer needs, FEMtools 3.5 maintenance releases will remain available for the dropped Unix OS throughout 2010 and until the next major FEMtools release. FEMtools users on the dropped OS are requested to prepare for a platform change in order to avoid future disruption to their software usage. Please contact FEMtools Support or your FEMtools Solutions Partner if you have any concerns or comments about this decision. Beijing Allstar Technology Corporation, China, is a CAE company focusing on product representation and distribution services, technical support and consulting to customers in astronautics, aeronautics, defense, automobile, railway, shipbuilding, rotary machinery, general machinery, civil engineering, electronics and energy. All employees are Ph.D. or master and each of them has more than 7 years of CAE application experience and test experience. They are familiar with most commercial FEA software and know Chinese customers? requests very well. Professional technical ability, industry experience and good communication with Chinese customers are the highlight of AllStar Tech. Allstar Tech and DDS are looking forward to help their customers in China on FEA applications such as correlation and structural modification analysis, FE-based design, design optimization, virtual prototyping, simulation process automation and structural safety evaluation. Dynamic Design Solutions (DDS), in collaboration with Structural Science Inc. (SSI), the FEMtools Solutions Partner for Japan, announces the launch of its FEMtools product website in Japanese language. The new web site will provide visitors from Japan with up to date product information and news as well as access to the FEMtools support site. Structural Science Inc. (SSI) has become the new main FEMtools Solutions Partner in Japan from January 1, 2010. SSI will provide sales and marketing of FEMtools, and technical support and maintenance services. SSI replaces Software Express Inc. (SOEX) after the retirement of its General Manager, Mr. Oda. SOEX has served as the FEMtools Solutions Partner in Japan for more than 10 years, and successfully introduced FEMtools to Japanese companies. This company also translated most FEMtools manuals to Japanese language. SSI already provided technical support services to several of our customers and has gained a strong knowledge of the FEMtools software. From now SSI will also become responsible for sales and marketing of FEMtools in Japan and support all Japanese customers with a new staff. During the transition phase, SOEX will continue to collaborate with SSI to guarantee a smooth transition. The sessions will be conducted by Bob Mearns, lead RLM software developer who has over 15 years experience developing and supporting software license managers. The first session is scheduled for the 10th of February at 11AM EST. Space is very limited so register now. The recorded webinars will be available for replay from the Reprise Software website. For many of our customers, FEMtools has become their reference tool for validating and updating FE models, especially for applications in structural dynamics simulation. For many years, however, the concepts of model verification and validation remained the domain of visionaries with no formal definitions and processes available. Recently, major engineering organizations and societies have taken initiatives to publish sustaining documents (what is, why do, or how to guides) that ultimately could become formal standards or best practices books for different engineering disciplines. NAFEMS and ASME (American Society of Mechanics Engineers) recently cooperated to produce a leaflet entitled "What is V&V?" The attractive tri-fold color flyer is intended to be an "eye catcher" that will be freely distributed at NAFEMS and ASME events. In addition to being a pocket sized introduction to Verification and Validation, the leaflet points to the work of the NAFEMS Analysis Management Working Group (AMWG) and the ASME V&V-10 Computational Solid Mechanics standards group, just two groups contributing to the ever increasingly popular and important areas of verification and validation in computational mechanics. The leaflet can be downloaded from the NAFEMS website (download). ASME has published a booklet entitled "Guide for Verification and Validation in Computational Solid Mechanics (ASME V&V 10-2006)" that can be purchased from their website (www.asme.org). DDS is a member of NAFEMS and the Analysis Management Working Group (AMWG). Dynamic Design Solutions announces the formation of FEMtools North America LLC. This new affiliated US company will operate from Florida to support North American FEMtools users and sales representatives with pre- and postsales technical support, training, and software customization services. It is our belief that the presence of a US based technical staff will not only allow us to better serve the existing FEMtools customer base and reduce technical support response times, but also increase FEMtools sales within the United States and Canada. FEMtools North America LLC will initially be manned by Dr. Tom Lauwagie. Before moving to the US, Tom spent three years working as a FEMtools application developer at the Dynamic Design Solutions HQ in Leuven, Belgium. In collaboration with North American sales representative NAVCON from Fullerton CA, Tom will present an intensive three-day course on the technologies that are incorporated in FEMtools on November 7-9, 2011. See Upcoming Events and Courses for more information. A function library is added to generate surface and volume meshes from a definition of the geometry (vertex, curve, surface). Unstructured surface meshes can be generated for generic surface patches and volume meshes are obtained from 2D meshes with operations like extrusion and revolving. This new FEMtools API function library complements the already available lattice-based mesh deformation ('morphing') and provides the functionality to mesh very complex geometries. It can be used for applications like parametric meshing for shape optimization, meshing design spaces for topology optimization or to implement mesh coarsening and refinement tools. Functions to verify the quality of imported or generated finite element meshes are now included. Quality metrics like aspect ratio, convexity, taper, warp angle and others can be computed on the fly and visualized with color-coded mesh graphics. Results can be further post-processed by computing histograms or sorting mesh quality values. Additional mesh quality metrics can be implemented using the FEMtools Script programming language. This new add-on tool is used to obtain the mass (M), center of gravity (CoG) and mass moments of inertia (MoI) from the low-frequency portion of measured accelerances (FRFs). These properties can be used as targets for finite element model updating, or to reduce components to lumped masses for model reduction in structural dynamics simulations or motion analysis. Experimentally obtained vibration shapes (Operational Deflection Shapes or ODS) can now be used to update stiffness, mass and damping parameters if information is available on the dynamic excitation forces. These forces can be measured themselves, for example as forcing displacements, velocities or accelerations and are applied to the finite element model. From the differences between simulated and experimentally-obtained ODS, conclusions can be drawn on required adjustments of stiffness, mass and damping. This new functionality is completely integrated within FEMtools Model Updating and can complement other updating types like using mode shapes or FRFs as reference responses. An important application of ODS-based model updating is monitoring of vibrating machinery for damage and structural health. By using efficient data management and powerful algorithms for sensitivities and model updating, FEMtools can handle very large numbers of updating parameters. Model updating using local element parameters like thickness or elastic modulus may result in a large number of updated properties that can vary from element to element. This is a standard strategy for explorative model updating to obtain information on local changes that may be required. Results must be interpreted in terms of changes that may be required to geometric refinement or mesh density. Such updated models, however, are not suitable for further analysis due to the large number of property cards in the finite element model. New postprocessing tools are now available to regroup elements based on their properties into a lower and practical number. Design of Experiments (DOE) and Response Surface Modeling (RSM) was already available in FEMtools 3.3 for applications in model updating. In FEMtools 3.4 these methods have now been integrated in FEMtools Optimization and can be used with generic optimization parameters, objective functions and constraint equations. Design of experiment (DOE) techniques aim at sampling the design space of a problem in an efficient way. The main goal of DOE is to obtain the required information with a minimum number of sampling points, as the evaluation of each sampling point requires an additional run of the FE-model. FEMtools provides the following designs: factorial designs, central composite designs, Latin hypercube designs, D-optimal designs, and user-defined designs. Response Surface Modeling (RSM) is used to build an approximate model to predict the response of the system in function of the design parameters. This approximate model can then be used to optimize the response of the considered system instead of the finite element model of which it was derived. FEMtools 3.4 supports the newest Microsoft Windows 7 operating systems in native 32-bit and 64-bit versions. See the FEMtools 3.4 Release Notes for complete information on this release. FEMtools 3.4 is available as a free upgrade to all customers with current maintenance and technical support contract. The installation packs for all supported OS can be downloaded from the FEMtools Support website. A new license file is required to run FEMtools 3.4. Contact support@femtools.com for more information on this release and to obtain your support website login password and a new license in case you have not yet received these. Dynamic Design Solutions invites you to attend the upcoming OMAC II workshop September 24-25, 2009 in Aalborg, Denmark. This two-days event is relevant for engineers and researchers working within the area of Operational Modal Analysis. You will learn to setup your tests, perform and validate your measurements, analyze your data and validate your results. In addition, you can get extensive training on finite element model correlation and updating using results obtained from Operational Modal Analysis. On May 11, 2009, Dynamic Design Solutions co-organized a seminar on "Smart Building Technology - Structural & Seismic Safety" that was held in Abu Dhabi, UAE. The goal of the seminar was to present current technologies for seismic response analysis and structural health monitoring of tall buildings. This seminar coincided with the start of a 3-years study that is meant to analyze the building structures throughout the Abu Dhabi emirate and make sure they would be able to cope with a serious tremor. Like other cities in the region, new development projects in Abu Dhabi include an increasing number of tall buildings that will have to be earthquake-resistant. Dynamic Design Solutions' CEO Eddy Dascotte presented a paper entitled "Evaluation of Structural Safety by Combining Computational Models and Test Data". The speech included a live demo of a random vibration test using a mockup of a 3D frame structure and a four-channel acceleration data acquisition system. Using operational modal analysis integrated with FEMtools Model Updating, it was demonstrated that a reduction of joint stiffness at the base of the frame structure could be identified by shifting resonance frequencies and differences in the mode shapes. For more information or a copy of the presentation, contact info@femtools.com. The Exhaust System Division of Faurecia, a long-time FEMtools customer, and Dynamic Design Solutions recently presented an optimization approach for tailoring the dynamic response of a complete exhaust system using finite element modeling. Before the optimization procedure is started, the FE model is updated using modal test data to ensure the validity of the FE model and to identify damping characteristic. The subsequent optimization is performed to keep the force transmitted by the exhaust system through the isolators to the car body below the design specifications, optimizing the stiffness of the decoupling elements. The goal is to ensure a good NVH (Noise Vibration Harshness) performance of the exhaust system. To ensure a computationally efficient process, Dynamic Design Solutions implemented an optimization routine that consists of two iteration loops: an inner and an outer loop. The inner iteration loop performs the optimization using a fast modal domain modification technique to predict the change of the dynamic response of the structure. However, the modal domain prediction is only accurate within a limited parameter range. Therefore, the outer iteration loop re-evaluates the full finite element model once the parameter changes exceed the Ă˘??trust-regionĂ˘?? bounds of the modal domain prediction. The solution of the full re-evaluation is then used as an improved base for the modal domain prediction in the inner iteration loop. This project involved the use of FEMtools Model Updating and the new nonlinear optimizer of FEMtools Optimization. The custom optimization routine was developed with FEMtools Script. Several well-known automotive companies have joined the ranks of FEMtools users in the past year. They include major car makers as well as component suppliers. Renault (Paris, France) has deployed several licenses of FEMtools Model Updating to be used by engineers at its Paris technical centers in Rueil-Malmaison and Guyancourt. The successful European car maker now standardizes on FEMtools for its test-FE analysis correlation and FE model updating projects that include engine and chassis development. This decision for company-wide deployment was taken after using pilot licenses at some departments for several years and after an intensive evaluation by the IT group. FEMtools will replace a legacy software that was in use at Renault for many years but did no longer satisfy current requirements. Other global car makers that actively use FEMtools are Ford Motor Corp. (USA) and Honda (Japan). Companies that develop and manufacture components and subsystems like engines, brakes, exhaust systems, suspensions, seats etc. also make active use of FEMtools for simulation, model validation, model updating and structural optimization. In most cases FEMtools is used by the NVH (Noise, Vibration, Harshness) groups. The following are some references of companies that use FEMtools for these purposes: BorgWarner Turbo Systems, Faurecia, Valeo, Tenneco, Magna Powertrain, Johnson Controls, MAN B&W Diesel, and AP Brakes. Dynamic Design Solutions is proudly celebrating its 15 years in business as an independent and employee-owned CAE software development company. We thank all our customers, partners and friends that have contributed to realizing our vision of a company that initially focused exclusively on researching and developing practical and easy-to-use software for validation and updating of finite element models. This field has long been, and still is, a niche that sits between the fast growing ranks of analysts and the conservative world of experimentalists. It has been an interesting challenge to find the formula for solutions that satisfy a very wide array of needs. At the ISMA 2008 conference in Leuven, Dynamic Design Solutions demonstrated an experimental setup integrating a 4-channel data acquisition system, ARTeMIS output-only modal analysis and FEMtools Optimization to identify a structural modification of a vibrating plate structure. Time series data (acceleration) was obtain from a 4-channel data acquisition system connected by USB to a notebook computer and directly imported in FEMtools. Using a FEMtools Script, data was transferred to ARTeMIS Extractor by ActiveX. ARTeMIS is a commercial software for Operational Modal Analysis that is used by civil engineers for ambient vibration analysis of large structures like bridges and buildings (www.svibs.com). ARTeMIS returned a set of resonance frequencies and mode shapes that were then displayed in FEMtools and correlated against analytical mode shapes. This setup was used to demonstrate localization of a 50 gram mass on a vibrating plate using correlation between the mode shapes of the plate without and with added mass and a custom updating script. The complete integration and automation, from data acquisition to modal correlation and model updating, is an efficient tool to support research in structural health evaluation systems (SHES) and damage identification. This paper presents an optimization approach for tailoring the dynamic response of a complete exhaust system using finite element modeling and was presented at the ISMA 2008 conference in Leuven, Belgium. It shows the results from a collaborative research project between Faurecia Exhaust System Division (R&D Center) and Dynamic Design Solutions. Dynamic Design Solutions announces that FEMtools 3.3 has been released on all supported operating systems. FEMtools 3.3 is a major revision of the FEMtools suite that adds new functionality and improves existing modules. The new release extends the application reach of FEMtools in the design optimization field. Upgraded FE interfaces (ANSYS, NASTRAN, ABAQUS, I-DEAS) to support the latest versions of these programs. Dynamic Design Solutions announces that the Government of the Hong Kong Special Administrative Region (HK-SAR) has ordered FEMtools Framework as the platform software to develop a custom monitoring system for the prestigious Hong Kong Stonecutters bridge. This is one of the longest cable-stayed bridges in the world, currently under construction (http://www.stonecuttersbridge.net). The custom monitoring system will be part of the bridge's Wind and Structural Health Monitoring System (WASHMS) that monitors the response of the bridge to wind loading, temperature loading, highway loading and seismic loading. Furthermore, several licenses of FEMtools Model Updating will be delivered to the onsite bridge control units for real-time correlation of the bridge mode shapes with reference modes obtained from a validated and updated finite element model. The bridge mode shapes will be obtained with ARTeMIS software (http://www.svibs.com) using output-only modal analysis. This order will be a major showcase for state-of-the-art structural health monitoring technology that uses operational modal testing and model updating-based damage identification applied on large scale civil engineering structures. 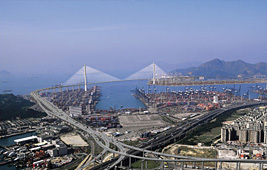 Artist impression of the Hong Kong Stonecutters bridge. Dynamic Design Solutions announces FEMtools Optimization, the newest member of its FEMtools family of products. FEMtools Optimization is a toolbox for general purpose and structural design optimization. In combination with FEMtools Model Updating, it provides the unique possibility to perform design optimization on validated and updated finite element models. Using a powerful non-linear optimizer, FEMtools can be used for solving arbitrary single or multi-objective non-linear optimization problems with a very large number of variables. Combined with FEMtools internal sensitivity computation, any type of optimization problem can be defined by user-programmed cost functions and constraint functions. For structural optimization using finite element analysis, function re-analysis can make use of FEMtools' internal solver capabilities or use drivers to pilot external programs like Nastran, Ansys or Abaqus. Shape	Optimization - For optimizing the shape of existing components. Topology Optimization - Creating new designs with a layout optimized for a given load and manufacturing constraints. The FEMtools open architecture, combined with the FEMtools Scripting language, provides virtually unlimited flexibility in the problem definition and offers function re-evaluation using your preferred FE-solver on Windows, Linux and Unix OS. FEMtools Optimization will first be released in Q2/2008 as a separate FEMtools 3.3 product configuration, or in combination with FEMtools Model Updating. Tools for design of experiments, response surface modeling, composite materials optimization and probabilistic design improvement will be added in subsequent releases. For preliminary product information, see FEMtools Optimization. Dynamic Design Solutions welcome ESTEQ Engineering as our newest FEMtools Solutions Partner serving our customers in Southern Africa. ESTEQ Engineering (Pty) Ltd is the leading supplier of simulation & testing technology solutions in Southern Africa. Their primary focus is to empower clients to become leaders in their respective industries through providing technology which can solve the most demanding engineering & scientific problems, in the shortest possible times. ESTEQ selects the leading technology suppliers from around the world and backs this technology with a team of the best people to provide the highest level of service to their clients. This service starts with helping companies' asses the business benefit they will get from implementing solutions which are tailored to client's requirements, through to implementation, technology transfer, training, support and consulting. This involves a long term relationship of mutual trust and growth which can only be achieved in a partnership. Following the assignment of FEMtools distributors in China earlier this year, DDS presented two product presentation seminars in Shanghai and Beijing during the month of October 2007. The seminar in Shanghai was hosted by the Noise and Vibration Institute of Jiao Tong Shanghai University and was co-organized by DMS-Co. Ltd. , FEMtools distributor for South China. The seminar in Beijing was organized and hosted by Eastern Max Technology Corp., FEMtools distributor for North China. Both seminars were well attended and signaled the start of a marketing and sales campaign targeting Chinese universities and high tech companies. Dynamic Design Solutions announces that it has strengthened its research and development team with the appointment of Dr. Tom Lauwagie as lead developer for design optimization related products. Tom obtained his PhD. in 2005 at the mechanical engineering department (PMA) of the Katholieke Universiteit Leuven (KUL) in the domain of material identification using model updating and optimization methods. June 2007 - FEMtools 3.2 Released! Dynamic Design Solutions announces that FEMtools 3.2 has been released. FEMtools 3.2 is a major revision of the FEMtools suite that adds new functionality and improves existing modules. New operating systems are supported and native 64-bit versions of the program are now available. 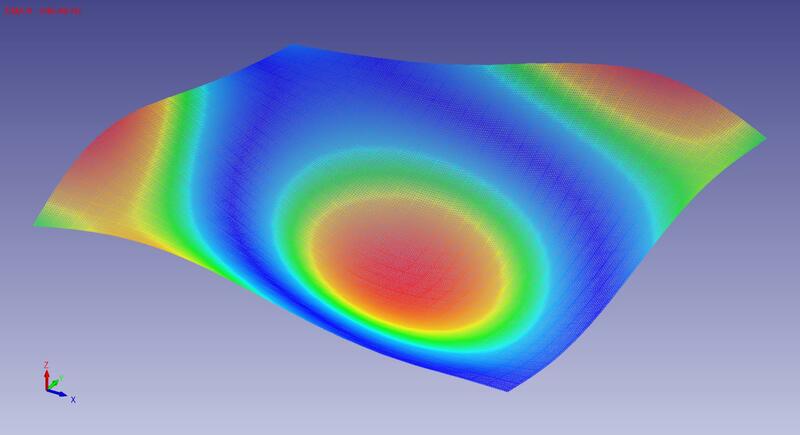 The new release continues Dynamic Design Solutions' commitment to the FE model validation and updating field and extends the application reach of FEMtools in the structural dynamics simulation field. Native 64-bit versions for all operating systems. Support for Windows XP 64-bit and Windows Vista (32-bit and 64-bit versions). A new licensing mechanism based on Reprise LM. New online help in HTML Help format (for Windows). There are 14 new commands, 10 new FEMtools Script functions and 21 new FEMtools API functions. New sparse complex Lanczos eigenvalue solver. New direct solutions for frequency response functions and harmonic analysis. Support for residual vectors in modal-based frequency response methods. New FEMtools Dynamics configuration replacing FEMtools SDM configuration. Support of center of gravity (cog) and mass moments of inertia as targets responses for model updating. The installation packs are available for download from the FEMtools support site. For the complete list of changes, see the FEMtools 3.2 Release Notes. With the upcoming release of FEMtools 3.2, Dynamic Design Solutions has changed the licensing mechanism and now uses Reprise LM (RLM) for all license types. Reprise LM is a new and innovative product that has been developed by licensing industry veterans who have previously developed the well known Flex LM product. RLM provides solutions for all FEMtools licensing needs, including node-locked licensing using a machine-specific hostid or a FEMtools dongle, floating network licenses, roaming licenses, and failover licenses. As a consequence of adopting RLM in FEMtools, all customer upgrading to version 3.2 need a new license file. Dynamic Design Solutions CEO Eddy Dascotte will present the opening keynote speech at the International Conference on Engineering Dynamics, to be held at Carvoeiro (Algarve, Portugal) from April 16-18, 2007. The subject of the presentation is "Model Updating for Structural Dynamics: Past, Present and Future Outlook". The FEMtools software will be on display at the exhibition that takes place during the conference. Dynamic Design Solutions announces that FEMtools is now distributed in China by Eastern Max Technology Corp.(EMAX). Eastern Max Technology Corp. of Beijing, China, is a company whose primary objectives are in sales, marketing, support services, training and consultancy work for simulation software. EMAX was established in 2003 and over the years, has extended its customer base to the areas of aviation, aerospace, automobile, shipbuilding, railway vehicle, electronics, electric power and general machinery. Other companies represented by EMAX include leading companies like Samtech (Samcef), CEI (EnSight), NEI( NeiNastran) etc. The consulting part covers FEA/CFD modeling, linear & non-linear analysis, NVH analysis, durability analysis, thermal analysis, motion dynamic analysis and CFD analysis. EMAX and DDS are looking forward to help their customers in China on FEA applications such as dynamic model correlation analysis, structural modification analysis, FE-based design, design optimization and virtual prototyping etc. AEDES Software S.N.C., an Italian company specializing in finite element analysis software for civil engineers, has licensed FEMtools FEA solvers for its 2007 software releases. The sparse solvers components of FEMtools Framework are integrated in AEdES finite element analysis products for linear/non-linear static analysis, modal analysis and seismic analysis. Contact DDS (info@femtools.com) for more information on using FEMtools Framework as a CAE development platform or for licensing components like graphics viewers, solvers, FEA interfaces, scripting language, or mesh generators. Dynamic Design Solutions announces that FEMtools is now distributed in India by Foretek Marketing Private Ltd.
Foretek Marketing Private Ltd. of Bangalore, India, is a company whose primary objectives are in sales, marketing, support services and consultancy work for testing equipment and simulation software (vibration, acoustics, climatic and dynamic). Foretek was established in 1979 and over the years, has undertaken various studies in the field of Noise, Vibration and Harshness (NVH). Many of the equipment that they have supplied are being used in prestigious projects of the country's aerospace, defense, railroad and automotive sectors. With the advent of newer technologies, the role of reliability testing and qualification testing of prototypes has become even more challenging. In keeping with the ever-increasing demands of the industry, it is their goal to keep abreast of the latest innovations so that they can be disseminated to customers in India. For this purpose, Foretek has a team of mechanical, electrical, electronic and software engineers based in their head office in Bangalore. Other companies represented by Foretek include leading companies like m+p, VXIT, Dewetron, Prodera, ESI-Group, Casella CEL, DJB, etc. Foretek and DDS are looking forward to help their customers in India on post modal applications such as correlation and structural modification analysis. They anticipate that in the near future this can be extended to CAE applications such as FE-based design, design validation, design optimization and virtual prototyping. Dynamic Design Solutions announces that FEMtools is now distributed in South Korea by CYLOS Co. Ltd.
CYLOS Co. Ltd is a sales & engineering company based in Suwon (near Seoul) offering product representation and distribution services, training and consulting related to NVH and structural dynamics in automotive, electronics, defense, environmental and heavy industries. The consulting part covers Test-CAE correlation, vibration testing, modal testing including SDM, vehicle testing, acoustics source localization etc. CYLOS also develops customized programs for automation of testing using various equipment. CYLOS can provide consulting related to simulation like linear and non-linear analysis, thermal analysis, fluid flow and motion dynamic analysis. CYCYLOS Co. Ltd. was founded in 2005 by Dr. S.H. Park who worked as CAE team manager of I-DEAS (SDRC) for three years before moving to Bruel and Kjaer Korea. There he worked for 7 years in various technical positions (technical team management, technical support, training, etc.). He also participated in consulting projects for the electronics, defense and automotive industries. Dynamic Design Solutions announces that FEMtools is now distributed in Spain by PROTOS ECI. PROTOS ECI (PROTOS Euro-Consultores de Ingenieria S. L. ) is an engineering company based in Madrid offering high quality consulting, product representation and distribution services to clients in the aerospace, aeronautics, automotive, defense and services industries. PROTOS ECI was founded by Dr. Kimon Alexiou in 2000. Kimon worked before as a Senior Engineering Consultant with the Structural Dynamics Research Corporation (SDRC) both in Hitchin, England and San Diego, USA for four years before moving to Spain. There he worked for the Space Division of CASA for 10 years in the Dynamics Laboratory where he led all modal testing, participated in various vibration test campaigns and the corresponding FEM analysis and correlation studies for the development and qualification of many satellite and Ariane-5 launcher sub-systems. The consulting services of PROTOS ECI cover the complete product cycle from design, simulation, analysis, test, analysis/test correlation, test qualification (vibrations, acoustics and environmental) and troubleshooting campaigns to client support and guidance for new technology and capacity acquisition. The portfolio of companies represented by PROTOS ECI includes leading manufacturers of vibration and acoustic hardware, software and services, like for e.g. m+p, MB Dynamics, 01dB-METRAVIB, ETS/SERVOTEST, DANTEC ETTEMEYER, etc. Products represented and distributed by PROTOS ECI are also used by them in their daily consulting activities and therefore PROTOS ECI are well positioned in offering effective solutions to clients and supporting them adequately both at the pre and post sale stages. Kimon Alexiou and other staff of PROTOS ECI will be pleased to respond to both specific inquiries and comments over the CAE Software and Services of DDS and general questions regarding the design, analysis, test (definition, preparation, performance), test/analysis correlation, model updating and product qualification processes. PROTOS ECI and DDS are looking forward to establishing a local and effective presence in Spain for working with and helping their clients to make the most of their FE models, turn them in Virtual Prototypes, enabling thus rapid design optimization and troubleshooting working practices. Software Express, Inc., FEMtools Solutions Partner in Japan, announces the availability of FEMtools manuals in Japanese language. The translation of the entire FEMtools 3.0 documentation took several months during 2005 and was done by personnel of Software Express. Currently the Japanese manuals are updated for FEMtools 3.1 and will be available shortly. For the past several years, Dynamic Design Solutions has developed a direct interface between FEMtools and the ABAQUS advanced finite element analysis software with the support of different ABAQUS distributors and customers. Dynamic Design Solutions has now formally joined the new ABAQUS Inc. Partner Program to further strengthen and extend the integration between FEMtools and ABAQUS. The ABAQUS translator is an optional component of FEMtools Framework. It imports an ABAQUS input file and converts a complete finite element model and associated properties into the FEMtools database table structure. Other functions of the translator are to import element mass and stiffness matrices, and shapes resulting from static, modal or forced response analysis. The ABAQUS finite element model and analysis results data can be used by all FEMtools application modules for advanced structural dynamics simulation, pretest planning, sensitivity analysis, model updating, and design optimization. An updated FE model, or an optimized design, can be exported and converted by the ABAQUS translator into a ready-to-use input deck for ABAQUS. This close integration between FEMtools and ABAQUS allows to automate processes that require numerous restarts of the ABAQUS solver like, for example, model updating, design of experiments, and probabilistic analysis. The finite element model updating method that is implemented in FEMtools can be used for identifying the elastic properties of isotropic, orthotropic and anisotropic materials. If the material properties or beam section properties are selected as global updating parameters, and the modes of vibration of a test specimen (obtained by measurement) are used as reference responses, then the updating procedure will iteratively adjust starting values until predicted dynamic behavior corresponds with observed one. Tom Lauwagie, Vibration-Based Methods for the Identification of the Elastic Properties of Layered Materials, Doctoral thesis, Catholic University of Leuven, October 2005. Erik Euler, Identification of the Material Properties of Slender Composite Structures, , MSc Thesis, University of Brussels, 2004. Click here to go to the complete list of downloadable documents. Dynamic Design Solutions announces the release of FEMtools 3.1. The 3.1 release includes numerous improvements and continues to add new functionality. The new release confirms the companies' technological leadership in the FE model validation and updating field and extends the application reach of FEMtools into the optimization field. Easy definition of superelements and integrated Craig-Bampton reduction - Superelements can now be easily defined using the FEMtools user interface from element sets. The Craig-Bampton reduction method has been integrated to obtain reliable reduced component matrices for structural dynamics synthesis applications. Reduced superelement matrices can be exported as Nastran DMIG. Alternatively, a Nastran driver can be used for doing the reduction outside FEMtools. Superelement-based model updating - Components that are reduced in FEMtools (e.g. 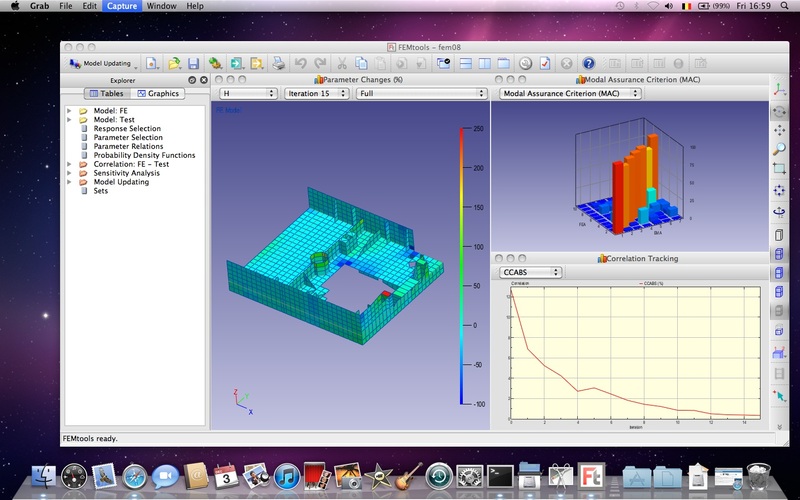 using Craig-Bampton) or imported Nastran DMIG can be used in model updating runs. Only the residual parts of a model, i.e. the parts that are not reduced and connect the superelements, are updated. This approach allows to significantly cut analysis time and reduces database size requirements. Generic finite difference gradients - New drivers for FE solvers and automation routines are included to compute the finite difference gradients for any structural response and parameter combination. FEMtools now offers a complete range of methods for sensitivity analysis from fast approximate modal methods over internal differential methods up to exact finite difference perturbation methods. Depending on the number and type of parameters, and the required precision, the most suitable method can be chosen for the given application. Mesh morphing - New functions for mesh morphing enable users to quickly modify existing Finite Element (FE) models instead of regenerating new models through the lengthy and error-prone process of meshing from CAD. Morphing of FE meshes is done by modifying the position of some control points and works extremely fast, even for large models. By defining the position of the control points as the variables in a design optimization routine, the shape and size of designs can be optimized faster and more efficiently than using parametric CAD models. FEMtools 3.1 is available for Windows 2000/XP, HP-UX, IBM AIX, Sun Solaris, SGI IRIX and Linux (Red Hat & SUSE). Shipping starts in October 2005. Model updating of civil engineering FE models is a growing field. This is a result of the growing popularity of output-only modal test technology which provides usable reference data for model updating. There is also the growing need for structural health monitoring solutions including damage detection, damage identification and residual lifetime estimation. Simulating the Dynamics of a Bell Tower - The time-domain animation of a bell tower response to bell-excitation is shown. The foundation stiffness was tuned using FEMtools Model Updating. The time-dependent shape contributions and non-linear pendulum movement of the bells were calculated separately with MathCAD and then imported to FEMtools. Earthquake Simulation of a Building - FEMtools Framework was used as the framework to program and integrate a novel approach to earthquake simulation. The method is very accurate and allows a model reduction of about 100000 DOF down to about 50 DOF which is very advantageous in a Monte Carlo simulation. Assessing the Seismic Vulnerability of Existing Motorway Bridges - FEMtools Correlation Analysis was used in a EU research project to assess seismic vulnerability of existing motorway bridges in Italy. Automated Model Updating using Ambient Vibration Data from a 48-Storey Building in Vancouver - This case study showed that is it possible to accomplish an effective model updating of a large civil engineering structure using the results from ambient vibration.